Hello! I am so happy that I decided to start blogging. I have "met" so many amazing women and recently have received tons of page views and lots of new followers thanks to super fun blog hops I've participated in. 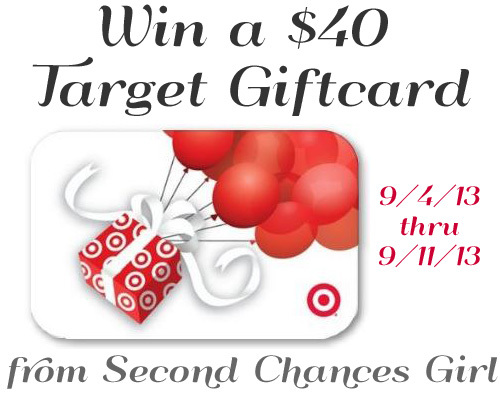 As a token of my appreciation, I am giving away a $40 Giftcard to my favorite store, Target!!! You can enter daily until 09/11/2013. Thank you and Good luck! M and I will be moving back to the USA soon, so the gift card would come in perfect to buy some stuff for our new apartment! Perfect for buying the munchkin's bday presents! Have a great day! I need organizational materials for my craft room (shelves, baskets, etc). I'm thinking that is what I would use it for... either that or Christmas for the Grandkids! What a great giveaway! I seriously don't know what I'd do without Target. I'd use this to buy school clothes. Thank you for this! I'd probably buy books and clothes at Target. I LOVE that store! I love Target! What a wonderful giveway. I hope I win!!! I would buy some new dinnerware. gonna need lots of stuff for baby on the way! Clothes for my kids or groceries or adorable things for my house. I love Target. Probably would buy some new work pants, thanks! I'd buy clothing for my daughter. Love Target! Thanks for the giveaway! Some toys for my son for christmas! I would buy diapers, wipes, some groceries. I would buy some new clothes for fall! i'd buy new workout clothes! And of course, once I actually walk into the store and see all the goodies they carry ~ all bets are off! I'd get a new rug!